↑ Felton, Alexander; Shoichet, Catherine E. (2 March 2016). "Sweden's Crown Princess Victoria has baby boy". CNN. สืบค้นเมื่อ 3 March 2016. ↑ "Kronprinsessparet väntar barn" [The Crown Princess Couple is expecting a child]. 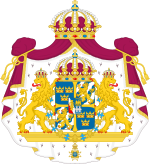 Royal Court of Sweden. 4 September 2015. สืบค้นเมื่อ 3 March 2015. หน้านี้แก้ไขล่าสุดเมื่อวันที่ 13 พฤศจิกายน 2561 เวลา 03:11 น.